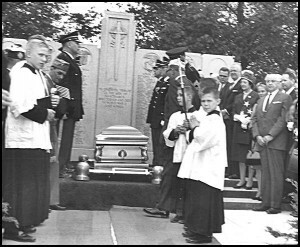 Col. Hamtramck was reburied at Veterans Memorial Park in a special ceremony in 1962. They’re usually surprised when we tell them that our collection dates back to 1793 — and that’s five years before Hamtramck even came to exist. Well, Hamtramck, the town. But Hamtramck the person, as in Jean Francois Hamtramck, had been around since he was born in 1756 in Montreal, Canada. J. F. Hamtramck came to the new United States to fight in the Revolution and stayed with the Continental army after the war. He was still with the army in 1793, when he was involved in a battle to remove the British from the Detroit area. They had lingered here long after the Revolution was over, and Col. Hamtramck was sent by George Washington to force the British out. He did, but he got into a bit of trouble when he was accused of not coming to the aid of some soldiers engaged with the British. However, Col. Hamtramck was later acquitted of the charges, and the story of the affair was printed in a newspaper in 1793. The Hamtramck Historical Museum has that newspaper in its collection, and a copy, along with an easy-to-read typed transcription of the story, can be seen on display at the Museum. The original is kept in a dark box where it is protected from harmful light. But it is in surprisingly good shape. Old newspapers from that period were printed on rag stock, which is far tougher than regular newsprint. And old papers, when treated carefully, can last a long time. The Museum archives also contain an invoice for expenses from Col. Hamtramck dated from about the same period. And we have in the Museum’s collection a newspaper from 1803, which contains Col. Hamtramck’s obituary. He was buried at St. Anne’s Church before being moved to Mt. Elliott Cemetery. 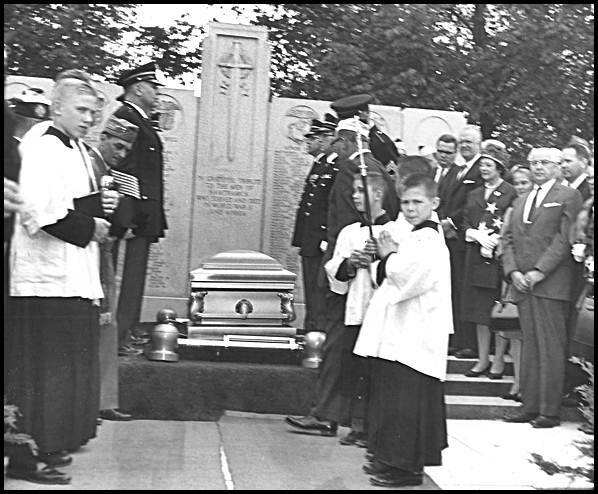 In 1962 his remains were reburied at Veterans Memorial Park in the town that now bears his name. After Col. Hamtramck died, all of his belongings were put in storage and were destroyed in the great Detroit fire of 1805. So if there were any portraits of him, they were destroyed then. Today, we don’t really know what he looked like, although there was a mention that he was fairly short. Col. Hamtramck’s travel case does still exist and is on display at the West Point military academy. But beyond that, all that we have of the Hamtramck family are some books inscribed by a Hamtramck descendant dated from the 1830s. And, of course, the colonel, himself. Visit the Hamtramck Historical Museum at 9525 Jos. Campau between Poland and Norwalk streets, 11 a.m. to 4 p.m. Saturdays and Sundays and by appointment. Call (313) 893-5027. I just came across the division of the Louis Edeline estate. One fifth of the estate went to the wards of William Henry Harrison, Julian and Harriette Hamtramck, children of J.F. Hamtramck and his first wife.